Endorsing is as simple as saying you support the tour and posting about our events and linking to our page. We get a ton of traffic on our site, from individuals, groups, media and students; we are happy to showcase other group to these visitors! Additionally we get a lot of visits from labs and universities to our website so we like to show that we are part of a network of people who are opposed to this (instead of just one small crew of people they only have to worry about for 2 days of the year when we get to town.) We know this fight is bigger than us, and we are very happy to act as a hub for the resistance to the pseudo-science that is vivisection! If you want to be part of our network, or show support for the tour, please fill out the form below! Thank you so much! For more info on Endorsements please scroll down below the form. 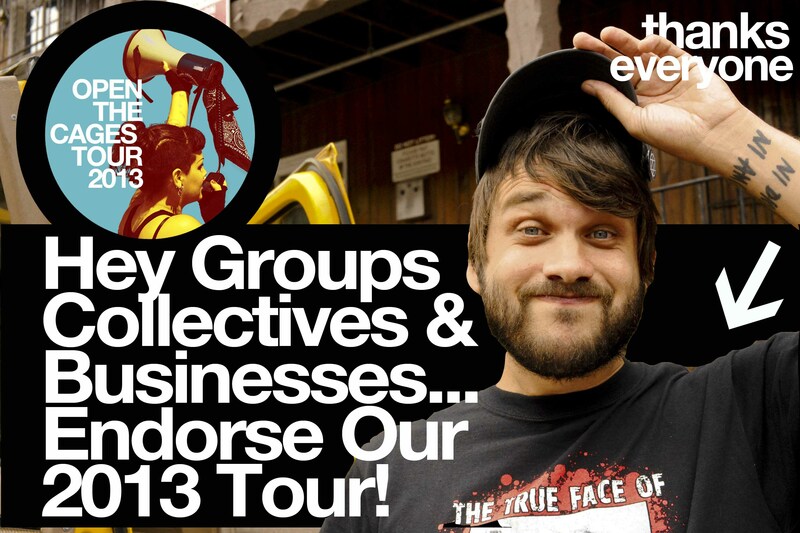 We love endorsements because they really help us to promote the efforts of local chapters and groups! We want to build up a big network of folks that share our beliefs, values and objectives so that individuals that come to our events know where to go after we leave if they want to keep being active. Having a list also gives us the ability to direct folks if they miss our events or if they come to find us after we have already been through town, or even if they are just checking out the website looking for resources. An endorsement doesn’t have to be material in any way, but really just adds to a growing list of opposition, and proves a network and resources before, during, and after the tour stops. We just really want to highlight local crews and groups so that our reach can boost and enhance the local campaigns, not override, sit on top of, or over shadow it. If your group wants to donate materials, zines, shirts or anything to the tour that we can take with us along our route, we also accept donations that are non-traditional or outside the capitalist system. The tour will accept any donations of mech, anarchist, vegan, animal liberation/total liberation, workers-rights, feminist, anti-oppression, antifa, anti-racist, intersectional, books/zines as well as stickers, postcards, or other goods. We also are looking for places to crash, eat, or get things printed. If your group or a contact of yours has the ability to assist us in addition to your endorsement, please let us know!